No, it's not the chicken that is skinny, it is the curry gravy that has been made skinny aka healthier. Curry powder has numerous health benefits, however, coconut milk is extremely fattening. With this recipe, you can reap the benefits of curry powder without worrying about piling on the pounds! Is there anyone who lives in Asia (or Great Britain for that matter) who doesn't like curry? Yes, there is - me. I have never been a fan of Chicken Curry, in particular, because most chicken curries that I have tasted are heavily laden with like 12 different spices, and I am very adverse to the taste and smell of too many spices all at once. My husband, however, LOVES curries of any sort, and of ALL cultures. In fact, he has on more than one occasion schooled me in how chicken curry from different cultures - the Malay chicken curry, Indian chicken curry, Nyonya chicken curry and the Chinese-style chicken curry, all taste different, some have a more "lemak" (coconut-ty) fragrance, some are more sour blahblah. To me, a chicken curry is a chicken curry. And I do not like chicken curry. My mum made this particular chicken curry on the first day of Chinese New Year for supper and it was the first smell that wafted into our noses when we stepped into the house at 9pm at night after an evening spent at my grandmother's place. This chicken curry is spicy, and I like spicy, has no additional spices, and I like 'no spices', and has NO coconut milk, all of which I like very much. Thus it is safe to say that this is the first chicken curry that I enjoy. Her version was a little tooooooo spicy, however, and I found myself at 11pm on the first day of CNY drenched in sweat as I gobbled down this chicken curry with slices of toast, standing next to the window in the kitchen in my feeble attempt to capture some sort of breeze to cool myself down with. Needless to say, there were no leftovers for the 2nd day of CNY - thanks to me, and my Curry-Lover husband. This version of Chicken Curry is labelled as "skinny" because unlike most of its counterparts, I did not add coconut milk into it, and if you would kindly click on this link, and scroll down to the 'Health Effects' section, you can read that coconut milk contains high levels of saturated fat. Instead of coconut milk, I added greek yogurt, an ingredient we always have in the fridge, as it is way healthier and has numerous health benefits as well. This curry recipe also requires Rempah, or paste, which we had previously used in the Nyonya Kuah Lada recipe, except this curry Rempah consists only of 2 ingredients. 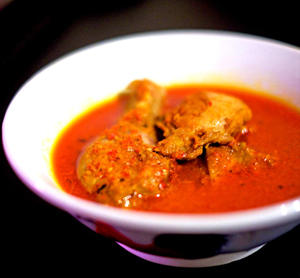 Here is the recipe for this fuss-free chicken curry! Start by marinating your chicken at least 3 hours before the time you intend to cook your curry. Rub the salt and 2 tablespoons of Curry powder on the chicken pieces, cover and let sit in the refrigerator. In the meantime, start preparing your curry paste (or Rempah) by blending the shallots and the red chillies into a paste separately (ie purple shallot paste in one bowl, red chilli paste in another). You can prepare extra portions of the Rempah and freeze them for future use as well. When you are ready to start cooking some curry, heat up a wok with all 3 tablespoons of canola oil. When the oil is ready, gently pour in the Rempah (curry paste) and fry it until it is fragrant and the smell envelops your entire kitchen (remember to turn the exhaust hood on beforehand). Now, throw in the remaining tablespoon of curry powder and mix it in well together with the Rempah, with that you can introduce your chicken pieces into the wok! Coat the chicken pieces in the Rempah, and stir around for about another minute or 2. Turn the fire down and gently pour in 1 cup of water or more if required, so long as the water covers the chicken pieces as we need for the chicken to cook in this liquid. Let the concoction simmer for about 10 minutes, then scoop in the greek yogurt and allow it to combine into the awesome-smelling red broth. Let the curry cook for another 10 minutes, or until chicken is thoroughly cooked. Before serving, taste the gravy, and add enough sugar to balance out the flavour. Serve with steamed white rice, or toasted bread slices/baguette. Either way, the spicy, delectable sauce will blow your mind! Enjoy! Chicken curry doesn't have to put you on a guilt-trip to taste good, this Skinny Chicken Curry will delight your taste buds without adding inches to your waistline. Start by marinating your chicken at least 3 hours before the time you intend to cook your curry - Rub the salt and 2 tablespoons of Curry powder on the chicken pieces, cover and let sit in the refrigerator. When you are ready to start cooking some curry, heat up a wok with all 3 tablespoons of canola oil. When the oil is ready, gently pour in the Rempah (curry paste) and fry it until it is fragrant. Next, throw in the remaining tablespoon of curry powder and mix it in well together with the Rempah. Add the chicken pieces into the wok. Coat the chicken pieces in the Rempah, and stir around for about another minute or 2. Turn the fire down and gently pour in 1 cup of water or more if required, so that the water covers the chicken pieces. Let the concoction simmer for about 10 minutes, then scoop in the greek yogurt and combine. Allow the curry cook for another 10 minutes, or until chicken is thoroughly cooked. May 27 The Best Steamed Chicken Ever!